Chifforobes are used to store items of importance as well as clothing. They can still be purchased in the retail market, but why not build one of your own? This is a sure way to get exactly what you need. A personalized chifforobe means every inch of storage space is custom-made to fit your specific needs. Building this one can be a challenge, so just take it one section at time. Place the face frame pieces on a worktable. Mark the two 72-inch pieces at 12 inches from one end. Next, apply glue on the ends of the three 44-inch pieces. Place the 3-inch-wide piece on the one end, one of the 2-inch-wide pieces of the 12-inch mark and the last one at the top. Clamp them tightly with the bar clamps. Let them dry overnight. Remove the clamps. Set the 58-inch piece inside the top opening adjacent to the left side of the frame. Measure from the bottom end of it and make marks at 13 and 15 inches. Next, measure up from the 15-inch mark and make marks at 13 and 15 inches again. Repeat this one more time. Be certain to mark the left side of the frame as well. You should have four spaces measuring 13 inches. Place the carpenter's square on the marks and draw lines across the width of the two adjacent pieces. Slide the 58-inch piece over so the 13-inch pieces fit between it and the left side of the frame. Apply glue to the ends of the 13-inch pieces and place them on the marks. Clamp them tightly with the bar clamps. Let them dry overnight. Be certain to clean excess glue with a damp cloth. Place the two 20-by-72-by-¾-inch plywood pieces on a worktable. Measure from one end and make marks at four and 12 inches. Place the framing square on the marks and draw lines across the width of the plywood. These are the ends of the chifforobe. Next, place the divider on the worktable and measure from one end and make a mark at four inches. Then make a mark at three-fourths inch. Place the carpenter's square on the three-fourths-inch mark and draw a line down to the four-inch mark. Cut this out with the jigsaw. Place one of the shelves on the worktable. Measure from the left 20-inch edge of the shelf and make a mark at 15 3/4 inches. Place the framing square on the mark and draw a line across the depth of the shelf. Apply glue to the right side of the line, stand the shelf up and place the divider against the shelf. Secure the shelf to the divider with the drywall screws. Place the other shelf on the worktable and apply glue to the 20-inch edges. Next, place the shelf between the ends on the line drawn four inches from the bottom and secure it to the ends with the finish nails. Apply glue to the 20-inch edges of the assembly from Step 3. Place it between the ends on the line drawn at 12 inches and secure it to the ends with the finish nails. Next, place the 4-inch nailing strip in the notch at the back of the divider. Secure it to the divider and the ends with the finish nails. Turn the cabinet over and apply glue to the edges. Place the ¼-inch plywood back on the cabinet and secure it with the 1d box nails. Turn the cabinet over and apply glue to the edges where the frame will meet it. 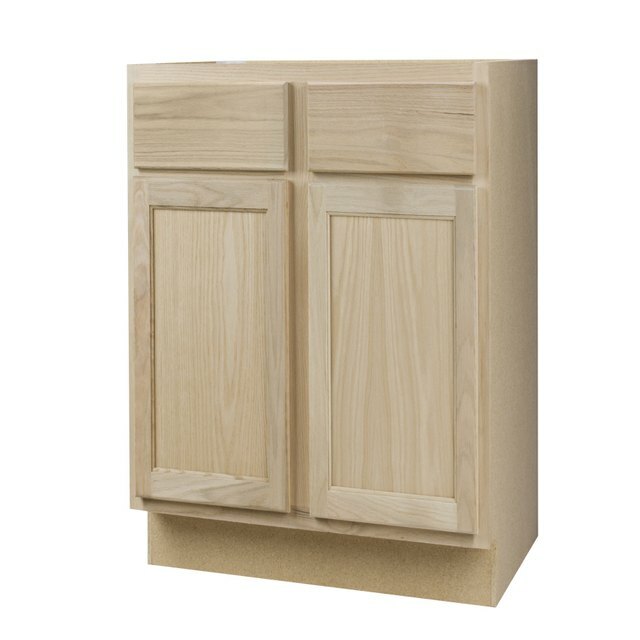 Secure the face frame to the cabinet with the 4d finish nails. Place the drawer fronts and the door on the worktable. Cut the veneer edge band to one inch longer than the width and height of each piece. For example, the door is 30 by 59 inches. Cut two pieces of the veneer edge band 60 inches long and two pieces 31 inches long. Repeat this for every drawer as well as the door. Secure the 31-inch pieces to the door first. Place the veneer on the edge of the door and heat it with the iron. Be certain not to burn the veneer with the iron. Once these cool, snap the veneer hanging over the ends by bending it over the corner. Repeat this process for the long edges of the door. Secure the veneer to the drawer fronts two edges at a time. Be certain to snap the veneer hanging over the ends before securing the other two edges. Sand the edges that hang over the front and back of the drawer fronts and door with a sanding block and 100-grit sandpaper. Place the drawer parts on the worktable. Apply glue to the edges of the 11-inch pieces, place one of them between the 18-inch pieces and secure them with the 1d box nails. Slide the ¼-inch plywood into the grooves, apply glue to the edges of another 11-inch piece, slip it between the sides and secure it with the 1d box nails. Place the drawer boxes on the drawer fronts according to the drawer slide manufacturer's instructions. Secure them together with the 1-inch wood screws. Install the drawer glide system to the drawers and the cabinet. Install the hinges on the door and then install the door to the cabinet. Use prefab drawer material to save time and labor. Lightly sand the edges on the veneer before applying finish. Clean up excess glue immediately with a damp cloth. Do not paint or stain the chifforobe without proper ventilation.